Becky Thompson | Consolidated Planning, Inc.
Becky Thompson is the Director of Talent Acquisition for Consolidated Planning. Becky is a seasoned recruiting professional after stints with Mass Mutual and John Hancock. 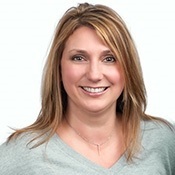 Becky also served as an Associate Agent at Northwestern Mutual, before focusing her talents solely on recruiting. In 2007, Becky was awarded the Jack Eulitt Scholarship from the Charlotte chapter of National Association of Insurance and Financial Advisors (NAIFA). The scholarship is awarded to an outstanding NAIFA Charlotte member aged 40 or younger. Becky is also involved in a number of organizations to help with networking and outreach for the firm. Becky is married to Mike Thompson, an Advisor with Consolidated Planning and has a daughter, son in law and 2 stepsons.